Philip TABER (1604 – 1672) was Alex’s 9th Great Grandfather; one of 1,024 in this generation of the Miller line. Lydia Masters was born about 1605 at Tiverton, Devon, England. Her parents were John MASTERS and Jane COX . At what date his wife, Lydia died does not appear in the colonial records. We know only that it was some time between the birth of his youngest child (about 1648) and the date of the deposition of Philip and his second wife, Jane, regarding the drowning death of a child (1669). At Providence, Rhode Island, 10 Jun 1669, in an inquest case related to the drowning death of the widow Ballou’s lad, Philip testified that he was 64 years of age, thus placing the year of his birth in about 1605. Philip’s second wife, Jane, also testified in the case stating that her age at the time was 64 years, thus placing the year of her birth also in about 1605. This also fixes 1669 as the date before which Philip’s first wife, Lydia Masters, must have died. In her deposition, Jane also referred to Joseph Tabor as son-in-law. (False): Philip Taber married second Jane “Latham”, sister of Cary Latham. In fact, the surname of Philip’s second wife is unknown. 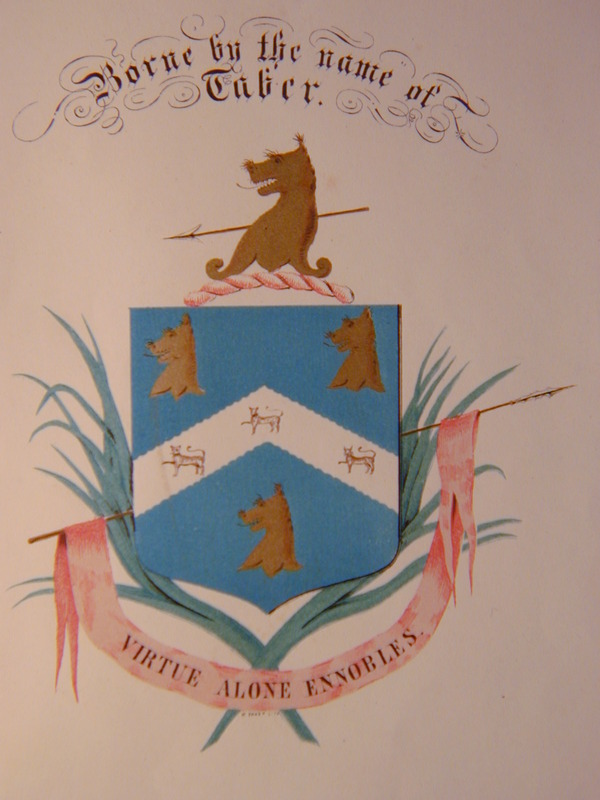 Cary Latham’s wife was also a daughter of John Masters, and it is through this connection that Latham and Taber were described as brothers-in-law. 2 Jun 1672 11 Nov 1730 Dartmouth, Mass. Philip was frequently moving from one town to another to engage in business as a carpenter and builder. When Yarmouth was first settled he went there and for 2 yrs was Deputy to the General Court of Plymouth Colony 1639-40. 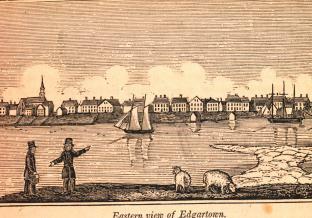 Moved to Martha’a Vineyard and lived at Pease’s Point, Edgartown. 1651 – Helped build the Mill Dam at New London. 1654 – Chosen as 1 of the 4 magistrates to govern Martha’s Vineyard. Court of the Union of the R.I. Colonies. Philip Taber was not a man who settled in one place for long. He must have come to New England with some capital as well as skill in his trade. The colonial records show that he frequently moved from town to town to engage in business as a sawyer, a carpenter and a builder. On 1 Apr 1634, Philip Taber contributed toward the construction of a protective fort for the harbor at Boston, promising two hundred feet of four-inch planks for the project. We find him next at Yarmouth, on Cape Cod, where he was one of the first settlers, and on 5 Mar 1639, he was appointed to a committee for the equal division of the planting land in first allotment. In 1639 and 1640 he was chosen a Deputy for Yarmouth in the earliest Assembly of Plymouth Colony. In 1640, his son John was baptized at Barnstable, Cape Cod (probably still residing at Yarmouth, however), as appears by the church records of Barnstable, the Rev. Mr. Lothrop baptized John, son of Philip Tabor dwelling at Yarmouth, a member of the church at Watertown. Six years later in 1646, his sons Philip, Thomas and Joseph were baptized. Philip Taber remained in Yarmouth a few years only and then removed to Great Harbor, later known as Edgartown, on the island of Martha’s Vineyard. Thomas Mayhew of Watertown had bought this island in 1641, and many of the earliest settlers of that island came from Watertown. It is quite probable that Philip Taber and his wife knew some of these people as former neighbors in Watertown, and it is evident that the newly started settlement would have been in need of a builder. Just when Philip Taber first came to the Vineyard is uncertain, but it must have been was before 1647, when he sold to John Bland his interest in a tract of land lying against Mr. Bland’s house at Mattakeekset. Philip Taber lived at Pease’s Point. He was evidently one of the “proprietors” of the island, as he shared in all the divisions of lands as long as he was a resident of the island. In 1647 Philip witnessed a document relating to Mr. Mayhew’s ward, Thomas Paine, which suggests that he was somewhat closely associated with Thomas Mayhew. It is evident that Philip left the island occasionally to undertake some new work of construction on the mainland. In 1651 he was in New London working with his brother-in-law, Nathaniel Masters, on the Mill Dam. It is possible that after leaving Yarmouth and before going to the Vineyard, he was in New London in 1642, or soon thereafter. In 1653, Philip Taber was back on the island, when with Thomas Mayhew he was chosen one of the four who acted as town’s committee, or Selectmen. In May 1653, Thomas Mayhew, Thomas Burchard and Philip Taber were chosen to divide to the inhabitants out of all the Necks so much land as they in the best judgment shall see meet. To Philip Taber was set off the neck called Ashakomaksett from the bridge that is at the East side of the head of the swampv. The modern name of this locality is Mahachet. Philip Taber, in the same year, shared in the division of the planting lands. During this and the next year or two he made several conveyances of land. 15 May 1655: It is agreed by ye 5 men yt Philip Tabor is proved to be a man that hath been an attempter of women’s chastities in a high degree. This is proved by Mary Butler and Mary Foulger, as divers more remote testimonies by others, and words testified from his own mouth with an horrible abuse of scripture to accomplish his wicked end. In August of the same year, Philip Taber conveyed his house and lot at Mahachet, and thereafter he had no further history on the Vineyard. Evidently Philip‘s indiscretions on the Vineyard in no way prevented him from taking a leading part in the affairs of his new place of residence. In 1656 he acted on the jury at the Court at Newport. In 1660, 1661 and 1663, he represented Portsmouth as a commissioner to the General Court of the Union of the Rhode Island Colonies. In 1663, he was on a committee to devise means of raising money to pay Mr. John Clarke for his services, as the agent of the Colonies in England. During his residence of about ten years in Portsmouth, he constantly served the town as Rater, Tax Collector, Constable, etc. On 31 Jan 1664, Philip (calling himself of Newport, at this date) sold a certain house at Portsmouth now or lately in occupation of Alexander Balcom. In 1665 he sold his house in Portsmouth, which was on the Newport road, to Anthony Shaw for £40 and three hundred good boards. In 1667 he was living in Providence, where he witnessed certain deeds of real estate to his son-in-law, Pardon Tillinghast, the noted Baptist minister, builder of the first wharf in Providence and founder of a wealthy and noted family of Rhode Island, who in 1664 had married his daughter Lydia. It is evident that Philip Taber was a man of some distinction in Providence. His daughter’s marriage to the leading minister and wealthiest merchant of the town would have accomplished that. In 1671, at his Majestie’s Court of Justices sitting at Newport for the Colony of Rhode Island and Providence Plantations” Philip Taber and Roger Williams gave evidence against one William Harris for speaking and writing against his Majestie’s gracious Charter to his Colony, which treasonable conduct was evidently regarded very seriously by the Court. There is no further record of Philip Taber after that. He probably died in Providence in about 1672. The final record of Philip Taber is dated 24 Feb 1672, when his testimony was read before the Assembly. There is apparently a family tradition to the effect that Philip settled finally at Tiverton, Rhode Island, and there died, but this is not consistent with the fact that Tiverton, Rhode Island was not incorporated by English colonists until 1694 (although there could have been settlers near that location earlier). 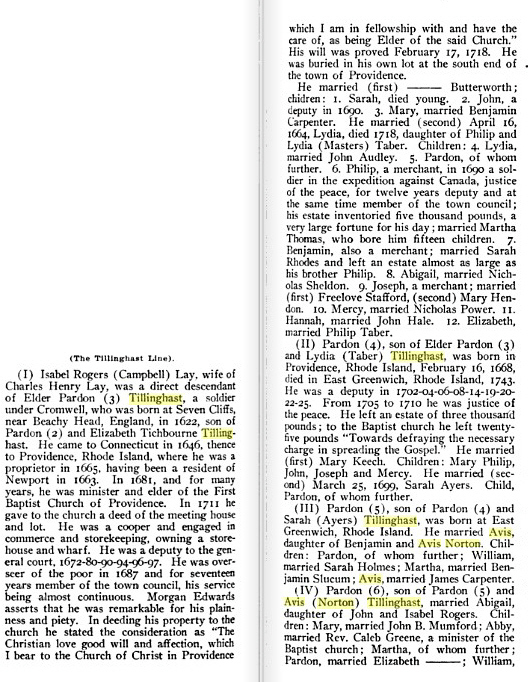 The following is from “The Descendants of Thomas, son of Philip Taber”, by George L. Randall, 1924: from the “Genealogy of Francis Weeks, by Dr. Frank Edgar Weeks, Kipton, Ohio: and from “The Tillinghast Family”, by John Gifford Tillinghast, Providence, R.I., 1889. Philip Taber was born probably in 1605, and came from Essex, England, in 1630 and settled first in Boston, freeman on October 19, 1630. He was a carpenter and builder and one of the original contributors to a floating fort to protect Boston, and offered to give 200 four inch planks. He owned five lots in Watertown which he sold and removed to Yarmouth. He was made freeman of Plymouth Colony on June 4, 1639, Deputy to the General Court in 1639-40. After a few years at Yarmouth, he moved to Great Harbor, later Edgartown on Martha’s Vineyard before 1647. He was one of the proprietors of the island and shared in all the divisions of land as long as he resided there. He was in New London in 1651, working with his brother in law Nathaniel Masters on the Mill Dam. It is possible he went to New London before going to the Vineyard in 1642: was still there in 1653 and allotted land at Ashakomaksett, now called Machet. A year or two after he was guilty of certain moral indiscretions which made it desirable for him to remove from the island. On January 3 1655 he was an inhabitant of Portsmouth, R.I. From 1660-1663 he represented Portsmouth as Commissioner to the General Court of the Union of Rhode Island Colonies. He lived there ten years as a rater, tax collector and constable &c. In 1664 he was a resident of Newport and in 1667 of Providence, where he died after 1672. Joseph’s first wife Hannah Gray was born 26 Jun 1659 in Yarmouth, Mass. 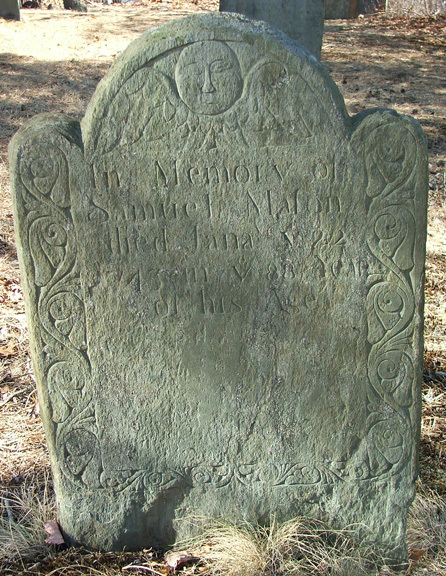 Hannah died in 1707 in Tiverton, Newport, Rhode Island. Joseph’s second wife Mary Gladden was born 1645 in New London, CT. Mary died 20 Jan 1734 in New London, New London, CT.
Phillip’s wife Mary Cooke was born 12 Jan 1652, Plymouth, Mass. Her parents were John Cooke and Sarah Warren. Her grandparents were [Mayflower passengers and our ancestors] Francis COOKE and Hester le MAHIEU. Mary died 26 Apr 1708 at Dartmouth. (False): Philip Taber had a daughter “Esther” who married a man “Mayhew”. There is no evidence that any member of the Mayhew family in the seventeenth century had a wife Esther, by any surname. Lydia’s first husband Rev. 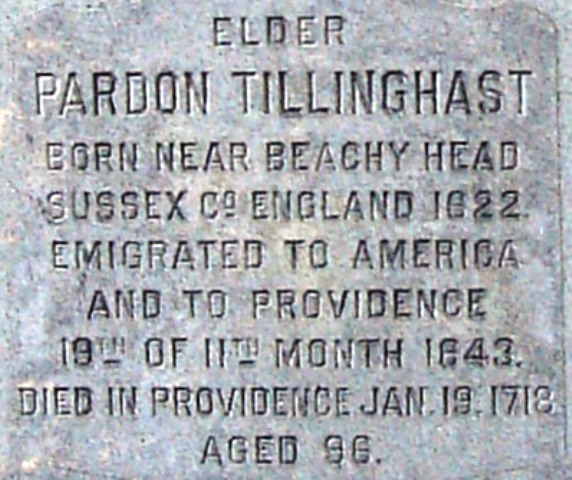 Pardon Tillinghast (wiki) was born 16 Mar 1621/22 at Seven Cliffs,, near Beechy Head, Sussex, England as it states on his grave marker in Providence, Rhode Island. The name “Pardon” was the surname of his paternal grandmother, Alice Pardon (1580-1624). In 1625, he was baptized in Streat Parish Church, Streat, East Sussex, England. He was the leading minister and the wealthiest man in town. In about 1654 he first married[__?__] Butterworth of Reheboth, Mass., and had three children, by her.. In many accounts her name is given as “Sarah”, but there is no evidence to support this (although the oldest child of this couple was named Sarah). Pardon’s first wife died in 1661. On 16 Apr 1664, he married second Lydia Taber. Pardon died 29 Jan 1717/18 Providence, RI. Lydia’s second husband Samuel Mason was born 12 Feb 1656/57 in Rehoboth, Mass. His parents were Sampson Mason and Mary Butterworth. He first married 28 Mar 1682 in Rehoboth, Mass to Elizabeth Millard (Oct 1659 – d. 3 Mar 1718 Rehoboth.) Elizabeth’s parents were John MILLARD Jr. and Elizabeth [__?__]. Samuel died 25 Jan 1743/44 in Swansea, Mass. Both Samuel and Elizabeth are buried in Kickimuit Cemetery, Warren, Rhode Island. 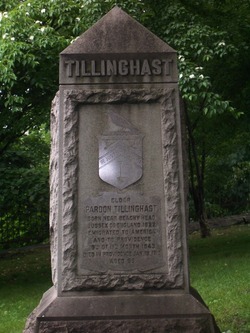 Prior to his emigration to America, some sources report that Pardon Tillinghast served as a soldier under Oliver Cromwell and participated in the battle of Marston Moor. This cannot be proved one way or the other. His reason for emigrating from England may have been the religious intolerance at the time of which the civil strife was symptomatic. Once in New England, he settled in Providence, Rhode Island and on 19 Jan 1645 was admitted a resident and allotted a share as a proprietor. He probably arrived in New England shortly before that. Pardon Tillinghast had little estate when he came to New England, and in 1650 he was taxed three shillings and four pence, a fairly low amount compared to other inhabitants. In 1658 he became a Providence freeman, but the following year he had a deed of land in Newport from Gov. Benedict Arnold and was called an Inhabitant of Newport in the deed. While living in Newport, he became involved in importing and selling dry goods and appears to have had a brewery, based on a 1684 deed in which he conveys a brewhous to his son John, along with his other Newport properties. About 1665 he was back in Providence when he received a lot there in a division of lands, and between 1672-1700 he served for six one-year terms as a Deputy to the General Assembly representing Providence. Pardon Tillinghast was a cooper like both his father and his sons but also was a successful merchant. In 1680 he was granted 20 square feet for building a storehouse with privilege of a wharf, over against his dwelling house. In doing this, he had built the first wharf in Providence, and is thus recognized as the founding pioneer of the town’s maritime trade. Subsequently, trade opened between Providence and other partners, from nearby colonies to as far as the West Indies and Europe. For the times, Pardon Tillinghast became a fairly wealthy man, and when he died, his estate, excluding real estate, was valued at £1,542. Putting this into perspective, of 78 Providence inventories between 1716 and 1726, his was the third highest in value. At some point, Pardon Tillinghast became a Baptist, and in October 1674 he and Stephen Harding were arrested in the Massachusetts Bay Colony, and charged with visiting the Puritan town of Mendon in order to Seduce People to their corrupt opinions. The two men appeared before the county court, but with no one present to prosecute them, they were admonished and released after being ordered to pay court costs. In 1681 Pardon Tillinghast became the pastor of the First Baptist Church in Providence. This church, founded by Roger Williams is still in existence, and it is the oldest Baptist congregation in America. In 1700 at his own expense, he built the first meeting-house of the First Baptist Church in Providence. In 1711, he deeded the building to the church, described as a “rude affair” in the shape of a hay cap with a fireplace in the middle with the smoke escaping from a hole in the roof. In the deed of conveyance he describes the faith and order of the church by quoting the Epistle to the Hebrews (describing what became known as Six Principle Baptists). He served as pastor without remuneration from 1681 until his death in 1718, and was the sixth pastor of this congregation, being preceded by Roger Williams, Chad Browne, Thomas Olney, William Wickenden, and Gregory Dexter. He was described by Baptist historian, Morgan Edwards, as being remarkable for his plainness and his piety. While serving as a clergyman, Pardon Tillinghast continued to be active with civic responsibilities as well and served on the Providence Town Council during most of the years from 1688-1707. He was also the town Treasurer from 1687-1707. Well advanced in years, he wrote his will on 15 Dec 1715, and it was proved on 11 February 1718. He died on 29 January 1718, and he was buried in a family cemetery in Providence that remains extant, though any original markers have been replaced with a single family monument. In 1689, Pardon Tillinghast was the author of a book of theology entitled Water-Baptism Plainly Proved by Scripture to Be a Gospel Precept. 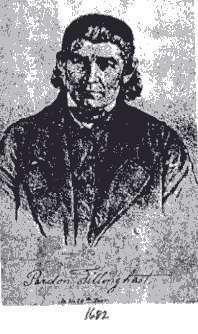 Among Pardon’s thousands of descendants are many of great prominence, including Continental Congress delegate Samuel Ward; Julia Ward Howe who wrote the Battle Hymn of the Republic; and Stephen Arnold Douglas who was involved in a series of famed debates with Abraham Lincoln in 1858, prior to a Senate race, and later lost to him in the 1860 presidential election. This entry was posted in 11th Generation, Immigrant - England, Line - Miller, Public Office, Wikipedia Famous and tagged Martha's Vineyard. Bookmark the permalink. The grist mil that Phillip owned in 1717 in Adamsville Rhode Island is still in operation today. Here is a link to it. http://www.graysgristmill.com/our-history/ I grew up eating Johnny Cakes from the flint corn meal from the mill. A local eatery used to serve Johnny Cakes and Eels as their signature dish! W Taber & sons in Providence, a store, a company or…..?. I have a clock with that name on the dial and the clock dates 1865-1875 any clues or help?